Clinic Synopsis: John Whitwell has attended every Midwest Clinic, since 1975. He will share his unique experiences including serving as conductor of the Huron High School Band (Ann Arbor, MI) at Midwest, in 1980. He has also presented several clinic sessions and began serving on the Board of Directors, in 1997. As a teacher and conductor at all levels, he will reflect on his involvement with The Midwest Clinic and its many contributions to his career and the music profession. 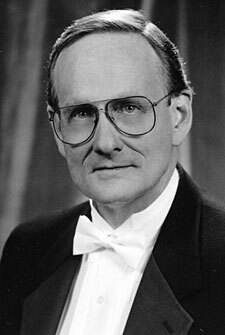 Clinician Biographical Information John L. Whitwell is director of bands emeritus at Michigan State University. He was professor of music, conductor of the Wind Symphony, and chair of the conducting area. He also held positions at Stephen F. Austin State University and Abilene Christian University. Early in his career he taught high schools in Ann Arbor, Huron, and Northwest Jackson. His bands have performed for the CBDNA, TMEA, Midwest Clinic, and the Conference on Vocal and Instrumental Music. He is past-president of the Big Ten Band Directors Association, and the North Central Division of CBDNA. He has received numerous prestigious awards and continues to maintain an active schedule as a guest conductor and clinician throughout the United States, Canada, Mexico, and abroad.